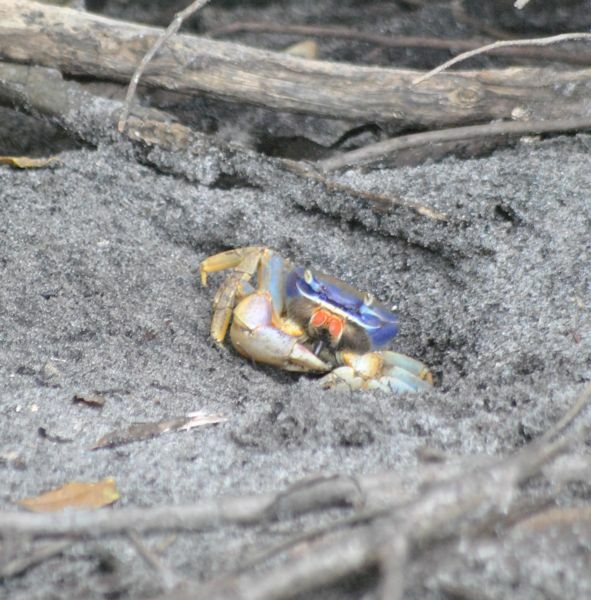 Blue land crab, photographed at Ocean Ridge Natural Area, Ocean Ridge, Palm Beach County, in August 2013. Blue land crabs are Florida's largest semi-terrestrial crab. We're not sure how great a distinction that might be, because frankly we don't know how many species of semi-terrestrial crabs live in Florida. Scientifically, they're known as Cardisoma quanhumi. They can measure 6 inches across, and weigh more than a pound. By comparison, ghost crabs, another semi-terrestrial crab inhabiting Florida, are about two inches across the back. They are found in Bermuda, the Bahamas, through the Caribbean, South Florida and Texas. They are limited in their range by sensitivity to cold. They are particularly popular in the Caribbean, thrown in a pot with some seasoning, allegedly tasting a lot like blue crabs. In some places, they're considered pests. Blue land crabs are semi-terrestrial because they live part of their life cycle in the ocean, as larvae. As adults, they live on land, with females returning to the sea periodically to release their eggs. 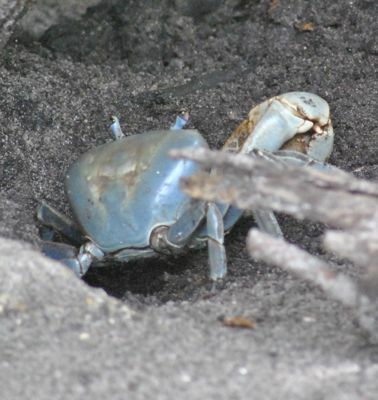 Blue land crabs burrow several feet deep — enough to let water seep in — and they can be found as much as 5 miles inland. They are primarlly vegetarians but they will eat carrion. Look at an adult blue land crab and you see a creature that's overcome huge odds to survive. Spawning season in Florida is June through December, peaking in October and November. A female will carry as 700,000 eggs per spawning under her belly for as long as 15 days until her offspring are ready to hatch. Then, she'll make the long trek to the ocean to release them. During this migration, a female blue land crab will travel as much as 100 meters per hour, or as much as 500 meters per night. Remember, blue land crabs can live as much as five miles inland. Almost all of her offspring will become meals for other creatures; those that survive to adulthood will go through five larval stages and one post larval stage before becoming actual crabs, a process that can take about 42 days. The crabs are brown rather than blue at this point; they will molt 60 times before becoming fully mature adults, which will take four years. During molting, they seal themselves in their burrows for as long as 10 days. There's some evidence that where blue land crabs are popular menu items, their numbers are dwindling. They are particularly vulnerable during spawning when it's possible for one person to catch hundreds of crabs in a single evening. The Florida Fish and Wildlife Conservation Commission has set up a series of regulations to protect the species. For one, to catch them you need a license, and the possession limit is 20 crabs. The season is restricted to Nov. 1 through June 30, and it's illegal to catch egg-bearing crabs or to strip them of their eggs. It's also illegal to catch them in any state park, or within the right-of-way of any federal, state or county-maintained road. 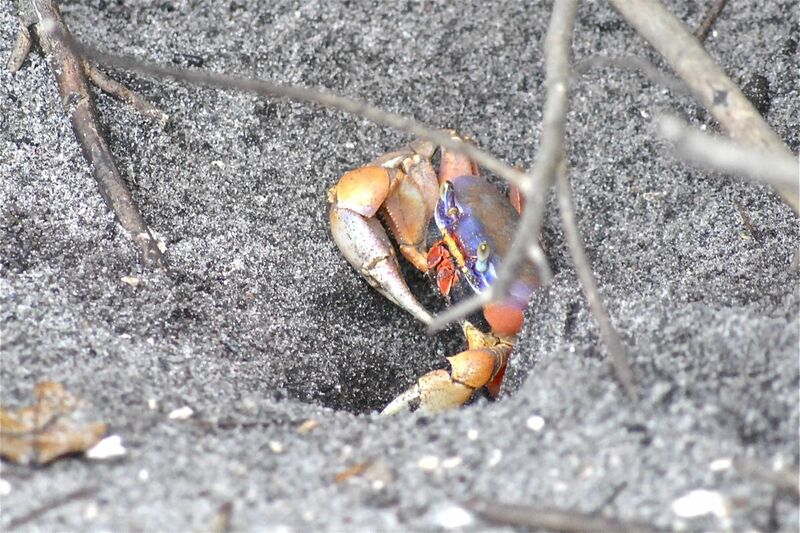 Blue land crabs are also known as giant land crabs, Abacos land crabs and great land crabs. They are members of the Gecarcinidae family.